A new Alaska ballot initiative is proposing new limits on state lawmakers' travel, daily expense payments and lobbyist-paid meals. 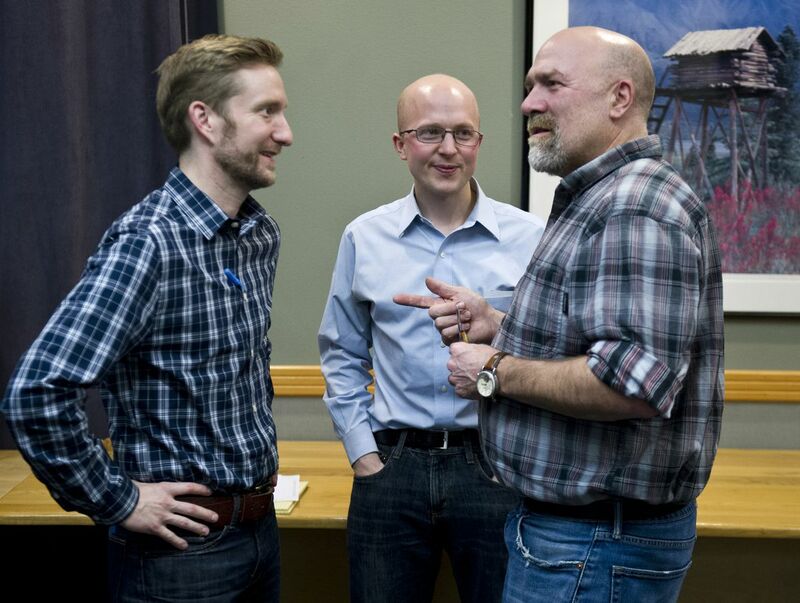 A pair of lawmakers — Democrat Jonathan Kreiss-Tomkins of Sitka and independent Jason Grenn of Anchorage — along with longtime Anchorage Republican activist Bonnie Jack filed their proposal with Lt. Gov. Byron Mallott's office Monday. The initiative proposal takes aim at several legislative perks and practices that have faced criticism amid Alaska's huge deficit, which has prompted lawmakers to slash spending on state programs. — It would cut off legislators' daily payments — up to $295 to cover food and lodging expenses — if it takes them more than an extra month to pass a budget after the end of their 90-day session. The 90-day limit is based on a voter initiative in 2006, but the Alaska Constitution allows for a 121-day session. — It would bar lawmakers and aides from accepting meals or drinks purchased by lobbyists, who occasionally treat legislators and staffers to dinners that cost hundreds of dollars. The law already requires lobbyists to report each time a meal and drink costs more than $15 for a legislator or legislative aide, though there's no restriction on lobbyists paying for food that's immediately consumed. — It would broaden the conflict-of-interest rules for state legislators, who would be required to declare more conflicts related to their jobs and family. — It would bar state payment for legislators' foreign travel unless they first file a public report showing how their trip would benefit the state. — It would ban "foreign-influenced corporations" from spending money on campaigns that target individual candidates — defining such corporations as those more than 5 percent owned by a non-U.S. citizen or entity. Grenn, a freshman who made legislative ethics a focus of his campaign last year, said the initiative aims to boost constituents' trust with legislators as they take on weighty issues like restructuring — and reducing — the Alaska Permanent Fund dividend. "We're asking them to trust their elected officials when we take on these big new ideas," he said. "We need to do things that are showing them that they can trust us, or that they can build on the trust that they have." Grenn proposed changes to the expense payments and conflict rules during the legislative session earlier this year, but his colleagues didn't adopt them into law. He acknowledged the initiative is likely to get "pushback" from other lawmakers. "I have no doubt that I'll probably get some sideways looks on this from other people in the building," he said, referring to the Capitol. "But my first concern is the people outside the building." Grenn said the sponsors want the initiative on the 2018 ballot, which gives them just a few months to gather the more than 30,000 petition signatures they'd need before a January deadline. A political group supporting the initiative, Alaskans for Integrity, has already raised about $25,000, nearly all of it from a Massachusetts-based organization called Represent.Us. The group, on its website, describes its mission as passing "powerful anti-corruption laws that stop political bribery, end secret money and fix our broken elections." Key donors to Represent.Us include the William and Flora Hewlett Foundation, the Atlantic Foundation and the Rockefeller Brothers Fund.